Bidding your last farewell to someone that played a significant part in your life can be done in several ways. You can do something they’ve always wanted to do but never had the chance, or write a short obituary to pay tribute to the deceased. Although an obituary is usually meant to report the recent death of a person in the form of a news article, the structure and purpose of such have since evolved with the help of technology and various print materials. In recent years, many individuals have begun using a card to write an obituary about a deceased loved one. This has helped widen both the scope and reach of the material in order to carry a message across more effectively. 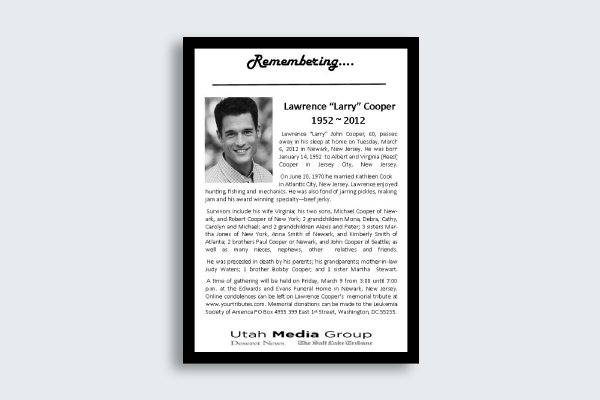 Obituary cards are ideal for delivering pertinent funeral and memorial information to those who might have shared any form of relationship with the deceased. The card is likely to contain a short biography of the individual as well as service details regarding one’s burial. 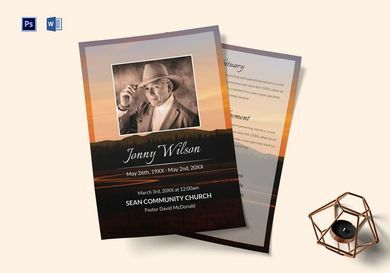 Using a funeral obituary card to communicate with an audience is one of the most efficient ways to make an important point as comprehensively as possible. It’s common practice for people to drop by a funeral service to pay their last respects in honor of someone who has recently passed. But for private functions—particularly those that are made exclusive to friends and family of a prominent figure in the community—funeral or memorial services are often managed as an invite-only event. 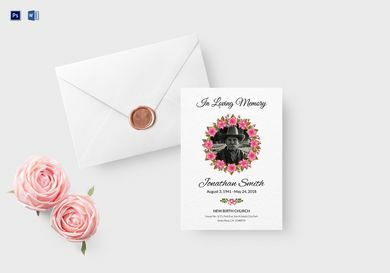 Invitation cards are typically sent to close friends and family members of the deceased to keep the gathering small and intimate. This is a good option for families who’d rather be surrounded by their inner circle during a tough time in their lives. Announcing the death of an individual can be done differently, depending on the means that you prefer. 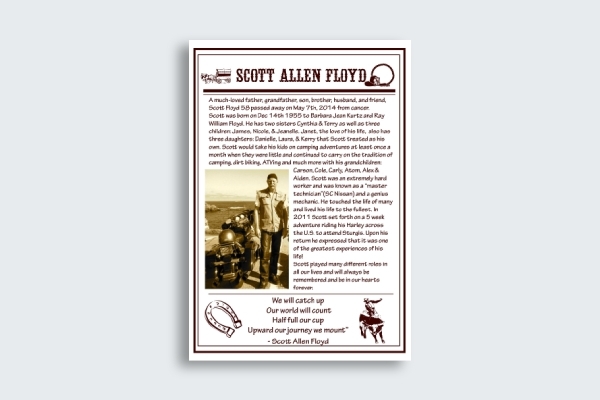 Making a death announcement using an obituary card is an ideal option for anyone who wants to make an account of a person’s life and deliver information regarding the upcoming funeral. 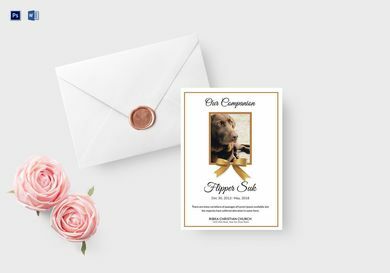 You can send the card to recipients once funeral arrangements have been planned to give recipients a heads-up and secure their attendance beforehand. Losing a child is one of the most unfortunate things that no parent should ever experience. But there are things that go beyond our control and we can’t always predict what happens to us and those we love at any given moment, so the least we can do is honor a loved one after their time here on Earth has come to an end. This obituary funeral template is specially designed to commemorate the life of a daughter, son, or sibling. 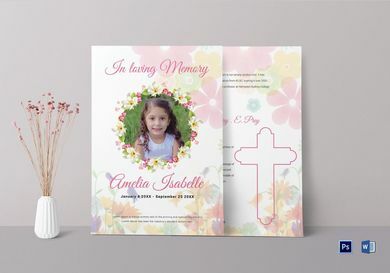 The pastel colors of the layout offer a subtle yet attractive appearance to the card, which is something that the kid would have appreciated if he or she was still with us today. There are days when we feel like the entire universe is against us, but all the weight in the world seem to fade away as soon as we come home to our pets who are there to cheerfully greet us. If you had it your way, you’d probably want your pet to live just as long as you would. Unfortunately, that isn’t always the case with our four-legged furbabies. Since we don’t exactly have a say against the inevitable, the best we can do is to commemorate our pets using an obituary memorial card. You can arrange a small funeral service and use the card as a token to remember the occasion. Funeral and memorial gatherings are known to be formal in nature. 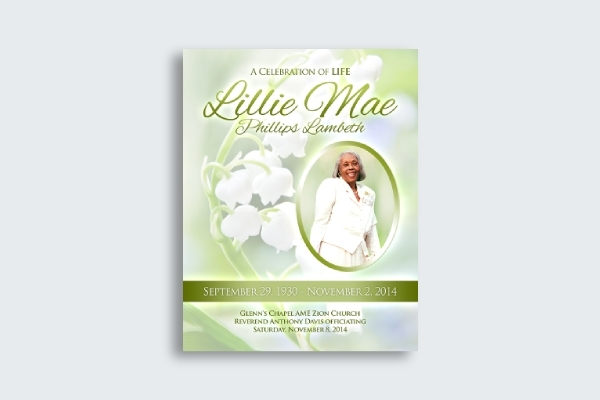 Thus, designing an elegant obituary card is always a good idea to consider. The key is to gather the basic elements together and to ensure that they complement one another perfectly. The general rules in design must also be applied to obtain a card design that’s even worth reading and keeping for the rest of time. 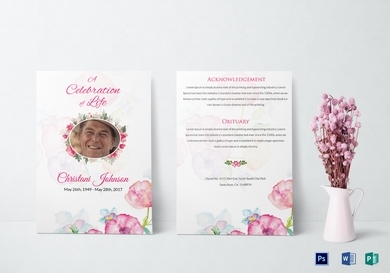 If you’re making an obituary card that’s structured the same way as a funeral booklet, designing a good cover should be one of your main priorities. Aim for a card cover design that will prompt a person to pick it up and read what’s inside. It’s also best to feature important funeral information on the cover of the card to remind readers of the upcoming events. Shown above is an example of a standard obituary card used for reporting one’s death in newspapers and bulletins. It contains a lengthy copy of one’s life to help us celebrate and remember the lives that were lost in the community. Though you can always keep the obituary as short as you want it to be in order to save space, lengthy obituaries are still popular in many traditions. After all, it won’t hurt to share significant pieces of one’s life to the public as a way of recognizing the life that was once lived. 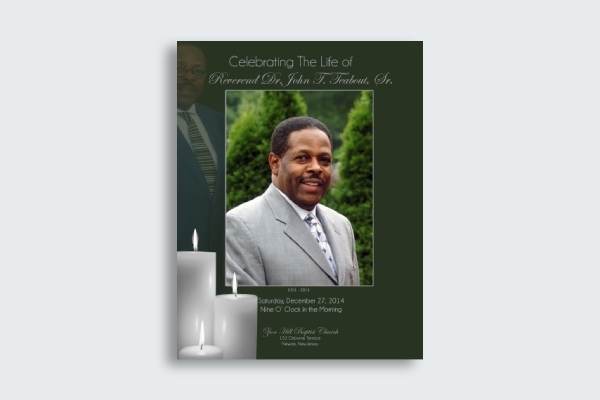 If you’re making a program to disseminate information about one’s life and the funeral service being arranged, this obituary card design will be a good reference for your cover. 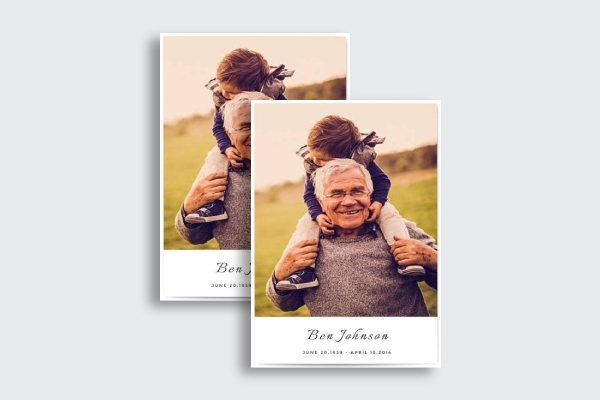 Including a heartwarming image of the deceased will allow you to portray the subject in a positive light as a means of commemorating the beauty of our existence. While an obituary can come in various formats, it generally consists of a death announcement, a biographical sketch, service times, special messages, and photos of the deceased. A funeral notice is typically included in the obituary to inform readers of the what, when, and where of the service. You don’t have to go crazy on graphics either. Don’t feel compelled to invest most of your time and effort trying to achieve a stunning visual, as what matters most about an obituary is your ability to relay a clear message to a particular group of readers.